When I first saw Tracee Ellis Ross on the Wendy Williams show I was smitten. Not only by her outfit but by her overall class and grace. She is def high on the fashion idol list for a few personal friends of mine and has been killing the game since her days as Joan Clayton on Girlfriends. But do not fret my dear show lovers! 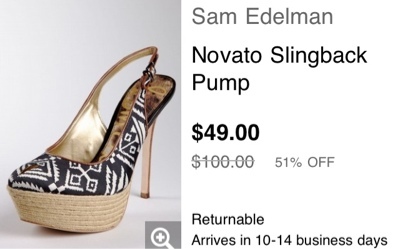 I found an adequate dupe by Sam Edelman over at Hautelook.com that is swoon worthy and in your budget. Let's face it: we all can't rock Louboutin! Aren't they cute and basically the same geometric print. I know the cork bottom is a little different but nevertheless..it's hot! Over on Hautelook.com the shoe is ON SALE and going quite fast. It goes up to a size 11!SO HURRY!!! I loved her outfit so much on this episode. The shoes are DOPE - so are the more affordable options!